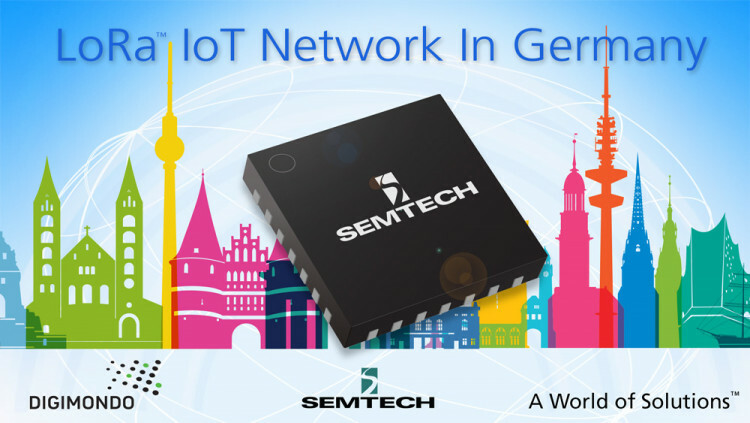 Semtech Corporation (Nasdaq: SMTC), a leading supplier of analog and mixed-signal semiconductors, will demonstrate a LoRaWAN™ Internet of Things (IoT) network deployed by Digimondo, a subsidiary of E.ON, a leading international energy supplier, at Embedded World 2016 on February 23-25 in Nuremberg, Germany. Digimondo launched low power wide area networks (LPWAN) over Nuremburg, Hamburg and Berlin and will demonstrate the Nuremburg network performance during the tradeshow by wirelessly tracking public transportation vehicles across the city. The vehicles’ movement will be displayed on a monitor at the Semtech (2-631) and Microchip (1-510) booths. Digimondo, started by E.ON in June 2015 to help digitalize the German energy industry, intends to launch an open LPWAN based on the LoRaWAN standardized specification that will enable innovative IoT applications, such as public transportation tracking, smart metering, air pollution measurement, boat tracking and more. The network infrastructure, which was tested in Hamburg and Berlin in 2015, has been approved for further deployments in Munich, Frankfurt, Stuttgart, Düsseldorf, Essen, Cologne, as well as rural areas where volumes are secured. The network is expected to be open to outside enterprises by mid-2016. In addition to the demo, Microchip, a member of the LoRa™ Alliance, an international group of industry leaders, telecom operators and solutions providers committed to standardizing LPWANs, will be giving away LoRa-based development kits connected to the Digimondo network during the Embedded World exhibition so attendees can evaluate the network’s performance. Development kits will be available on a first-come, first-served basis to select clients at Microchip’s booth 1-510. Both Digimondo’s network and Microchip’s development kit are equipped with Semtech LoRa RF technology, which was developed to enable LPWANs and IoT applications. LoRa technology offers unprecedented range, battery life, penetrability and connectivity, and it has been implemented in a wide range of LPWAN and application deployments worldwide. LoRa technology is being used for agriculture monitoring, public safety, building and infrastructure management, water conservation, natural disaster tracking and more. All statements contained herein that are not statements of historical fact, including statements that use the words “will,” “intends,” “enable,” “provides” or other similar words or expressions, that describe Semtech Corporation’s or its management’s future plans, objectives or goals are “forward-looking statements” and are made pursuant to the Safe-Harbor provisions of the Private Securities Litigation Reform Act of 1995, as amended. Such forward-looking statements involve known and unknown risks, uncertainties and other factors that could cause the actual results of Semtech Corporation to be materially different from the historical results and/or from any future results or outcomes expressed or implied by such forward-looking statements. Such factors are further addressed in Semtech Corporation’s annual and quarterly reports, and in other documents or reports, filed with the Securities and Exchange Commission (www.sec.gov) including, without limitation, information under the captions “Management's Discussion and Analysis of Financial Condition and Results of Operations” and “Risk Factors”. Semtech Corporation assumes no obligation to update any forward-looking statements in order to reflect events or circumstances that may arise after the date of this release, except as required by law.